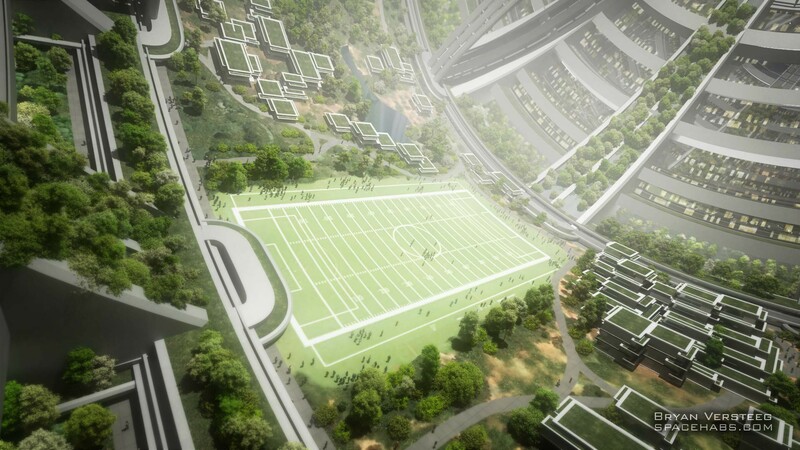 As an artist and science/tech enthusiast who has spent most of his life imagining the future of public spaces, homes, cities, and the effect of technological innovations on each, I've always tried to project a logical but optimistic path for human progress. Not just where we may go, but why we would go and what it would be like once we got there. To me, space is a logical step in our collective path. Humans have always wanted to climb the next hill or sail uncharted waters to see what awaited us over the horizon. We have spread to all ‘corners’ of this earth, at times to the detriment of the life that was already there. In space, we fulfill an entirely different role. When we build a space station and bring life to it, we are actually “planting” a beautiful habitat is where once there was none. This is what inspired me to imagine these spaces. I do not subscribe to the notion that living in space will either be the sterile lab version of space stations or a dirty dystopian version, but rather I envision a third option where humans personalize the space for comfort and happiness as we have done as a species ever since we started painting the walls of our caves. Since the early 70's there have been well researched models of what the structures of a large scale space settlements could look like. People interested in sci-fi would be familiar with shapes like the Bernal Sphere, Stanford Torus, and the O’Neil Cylinder. Each of these shapes offered interesting possibilities and solved particular challenges, while sometimes raising entirely new problems. A 2006 study focusing on the feasibility of such large structures generated some very interesting conclusions about stability through rotation and calculations about habitable volume per shielding and structural mass. Some shapes like the Stanford Torus or O’Neil Cylinder would tend to develop a critical wobble in simulations that would require constant corrections. A shape like the Bernal Sphere was inherently stable while rotating but offered the least amount of continuous 1G space of all the settlement options. Although the Stanford Torus is probably the most widely used structure in science fiction, it has the least amount of habitable volume per shielding and structural mass. The result of the 2006 study is a concept referred to as Kalpana One (Globus, Arora, Bajoria, Strout). The design is named for NASA astronaut Kalpana Chawla. She was one of the seven crew members killed in the 2003 Space Shuttle Columbia disaster. While consulting with Al Globus, (one of the authors of the Kalpana One study) I was intrigued by the potential of this type of structure to offer its inhabitants a lifestyle somewhat similar to that of a person living in a small town (like the small town Globus lives in that he modeled the scale after). This is what motivated me to explore the possibilities of this kind of habitat (well before production of the movie Elisium or the game Mass Effect’s Citadel in case you were wondering). Although the structure of my version is faithful to the study, my individual interpretation of it does take some artistic license. The Kalpana One structure is a cylinder with a radius of 250m and a length of 325m. A walk around then etire circumference would be about 1600 meters or one mile. By spinning at 2 revolutions per minute, people living inside would experience what would feel like normal Earth gravity. 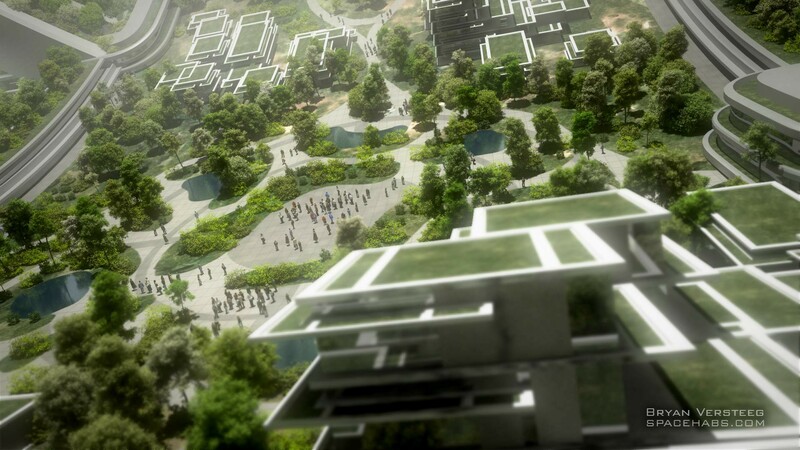 This scale could comfortably house about 3000 inhabitants at a reasonable density. 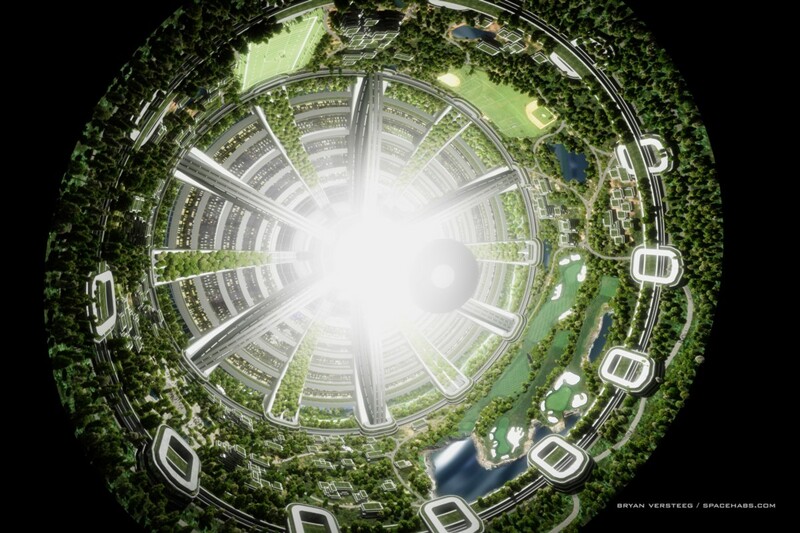 Construction of this type of settlement would obviously require significant changes to space infrastructure. Current launch costs from Earth for materials range from $5,000-$20,000 per pound and even with incredible progress being achieved by companies like SpaceX, the total tonnage required for large scale industrial projects suggest that getting resources to the structure will always be a significant issue. This is where asteroid mining will play a pivotal role in fulfilling the supply requirements of space stations and settlements utilizing the abundant, available space resources. Only through the commercialization of virtually inexhaustible resources available in space can we realistically imagine the immense opportunities that wait for us. In this type of discussion, it is often difficult for a person who is not familiar with current exploration projects and technological advances to distinguish between science fiction because we can’t do it, or science fiction because we have not done it yet. 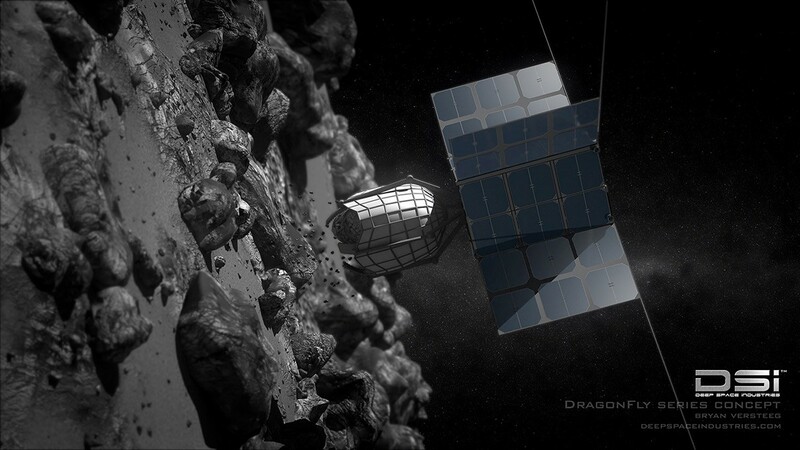 Asteroid mining falls in the “have not done it yet” category. As a co-founder of the company Deep Space Industries I can confirm that we are working passionately and effectively to develop the technical resources, capabilities and system integration required to discover, harvest, process, and manufacture in-space resources and commercialize the products. Asteroids have all of the copper, nickel, iron, gold, platinum that we would ever need to build habitats for millions. Asteroid mining has the potential to supply all of the materials and resources required for the expansion of humankind off of the Earth without damaging a single living ecosystem. It is estimated that the largest asteroid Ceres, has materials to build/construct settlements that would equal between 100 and 1,000 times the surface of the Earth. There are also millions of smaller asteroids that could provide us virtually an endless amount of resources. Some of which are potentially dangerous to Earth and by processing, we can eliminate the threat completely. 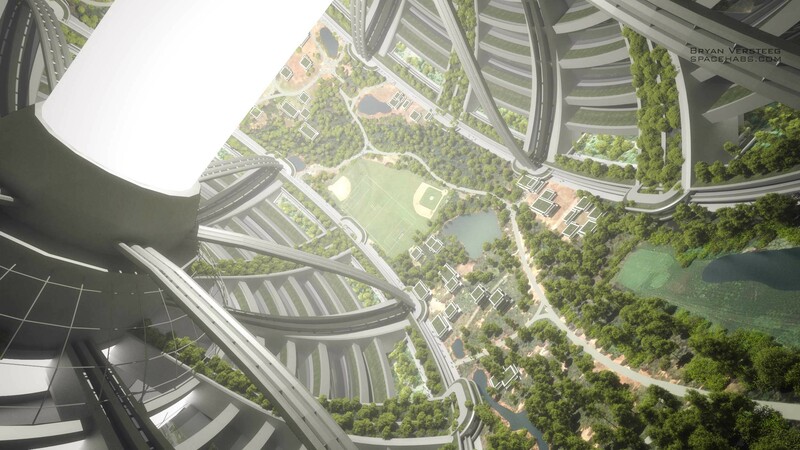 I believe it’s the potential quality of life that is the most fascinating unknown in any imagined habitable space. Sure we could live there, but would we want to? Once settlements are built, it is the interior of these habitats — the place that people will live their daily lives-that really fascinate me. I believe that people will always want to bring nature, a reminder of Earth, with them. In the same way that someone who lives on the 20th floor of a tower may want to have plants in their living room or participate in planting a suburban community garden, it is soothing to be around the greenery. We have a need to be surrounded by this diversity of life. Creating ecosystems can serve many purposes in addition to the therapeutic. 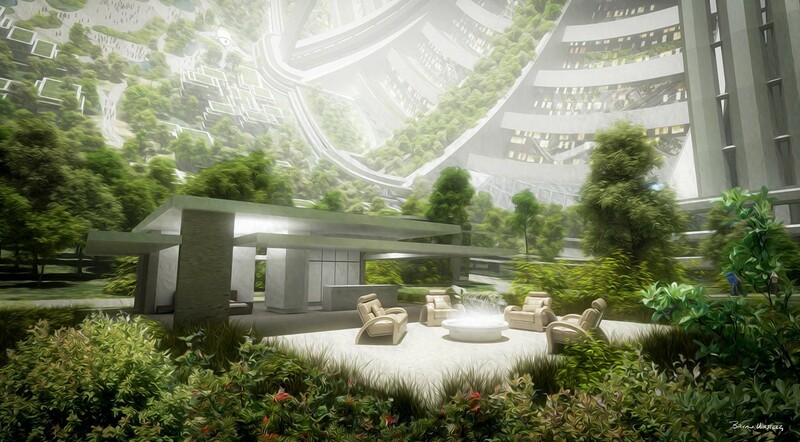 Indoor plants can improve air quality and in a closed system like a space settlement can serve to cycle carbon out of the air and replenish it with oxygen. These plants will also produce the variety of foods required. The agricultural zones of these stations could also serve as extremely valuable resources for the preservation of specific species. 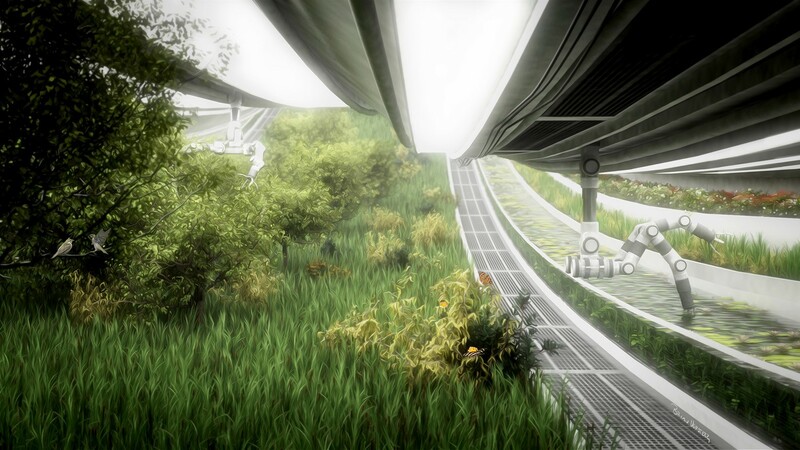 More than just a farm, they could serve as a futuristic “Ark” maintaining balanced ecosystems for the health of the inhabitants as well as acting as an off Earth safety deposit vault of flora and fauna. The social aspect of these settlements would also provide inhabitants with a sense of community and prevent feelings of isolation. As in every community, recreation and an enjoyable, healthy lifestyle will need to be created. These spaces can be used to incorporate typical sports and even the opportunity to design new games. Since the “gravity” in these stations is actually centripetal force, the trajectory of a thrown ball for example will appear to curve perpendicularly to the direction of the spinning of structure. This changes all sports. The centripetal force decreases as you get closer to the axis of the spin so the “upper” levels will have less “gravity” with the effect that while playing sports your body only feels fractionally as heavy as it would on Earth. 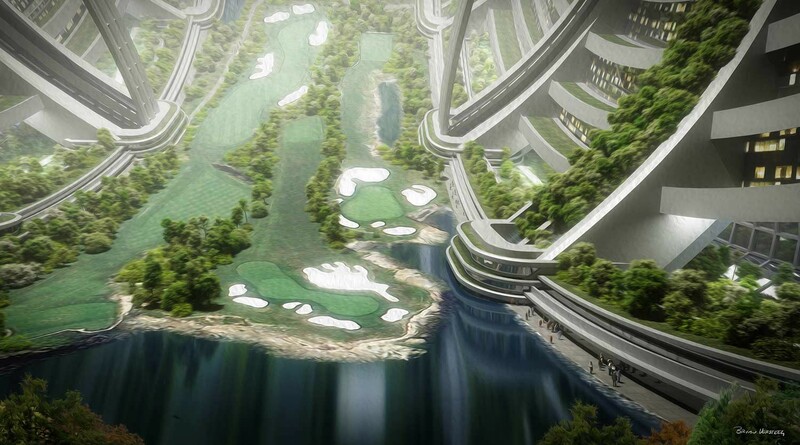 While I am not suggesting that all space settlements should have a golf course, like any small town, the residents could choose whether or not it is an efficient use of space and an effective form of recreation. Since I like golf, I do take into account the availability of facilities when planning vacations and would certainly prefer to move to a town that had at least one small municipal course. If there are large numbers of these types of settlements, you could choose the settlement that fits your lifestyle. As the chief designer and self ellected mayor of this version of a settlement, I created a 3 hole golf course that I could play 3 times for 9 holes. Since I limited myself to 3 holes, I wanted some good ones so I modeled these after 3 of my favorite holes from the Pebble Beach golf course. The center axis is the “Sun” of the settlement. It would fade on or off through 24 hour cycles to simulate our natural circadian rhythms. In the same way that lighting is completely controlled, precipitation can be micromanaged to give precisely the amount of water wherever and whenever it is needed. In all likelihood, by the time we are capable of building in space on this scale, we will be able to look back at ideas like this and muse about our naivety. For now, the only purpose of a project like this is to dream. Only after we pick an ambitious path and try to to follow it can we learn the extent of what it is we don’t know. Please do not take these images. These are Bryan’s work, this is his job, he lives off of this work as an artist. He has generously agreed to share these images and his reflections here so that you can see them and learn more about his vision. Please contact him if you would like to arrange to use his images for any reason. All images are copyright Bryan Versteeg / Spacehabs.com. What would it look like if we tried...? Artist, designer, tech geek, futurist, maker, builder.